Elodie Fagan works at Pinterest. And if she isn’t cataloging her whole life in a chart, she aims to organize it around the Toltec spirit of the four agreements: "Be impeccable with your word. Never take anything personally. Don’t make assumptions. Always do your best". Swimsuit: Adidas. All Images by Corinne Stoll. Determined and generous, she is the voice of the Récho project that she started with nine other women: a food truck whose mission is to bring a little joy to the refugees arriving in France. Work that demands energy and tough skin, two strengths she finds at the bottom of the pool or on a yoga mat. Elodie: Contemporary dance and what I remember most is the stress, the healthy performance stress. It demanded a greater attention to detail and to rhythm, elegance. It was a great source of satisfaction to have the impression of creating something beautiful especially at the age of seven. E: Swimming. I really enjoy loosing myself underwater and to swim laps practicing apnea. Everything in the surrounding disappears and there is no noise. It is really a unique moment, much like the practice of yoga that I recently discovered. It is an exceptional individual experience, a pause in the day. I/O: An important memory relating to exercise? E: Climbing an Indonesian volcano in the middle of the night in an hour and a half; it was both a great challenge and source of immense strength. To complete a headstand in yoga was also a great feeling of accomplishment after years of failing PE! E: Yes completely. To notice that I am capable of accomplishing things that seemed impossible, it gives me confidence in my abilities, in my endurance and in my perseverance. When you participate in a physical activity that you enjoy you discover a new part of yourself. E: I never stress about arriving 20 minutes later to work because I was at the pool or at yoga. I simply do not sacrifice my well being for work, because I believe the latter benefits from the former. Every morning or evening I try to have a ritual (like meditating or reciting mantras). I am not always consistent but I try not to abandon the initiative. E: I have trouble sometimes with the mantras you see everywhere on Instagram, because they are often demanding, thus I like this one: do your best. I/O: How would you define the Parisians relationship to exercise and well being? E: It is very individual. It is not something that is shared or talked about, as the French culture is prude, I believe, when it comes to its relationship with the body and performance. We are quite free with our sexuality but less with regard to being proud of our bodies and to do so openly. It is rude to talk about ones body. I think Parisians pay special attention to their figure so have to exercise but speak little about it, or do so mocking themselves as they cannot admit that a figure is something you have to work at: the famous fantasy of “the effortless French way”. I/O: Did the attitude towards exercise change in Paris over the last few years? E: I would say yes, regardless of all this, things have changed especially with social media that reveals routines and intimacy. Brands have also adopted the subject, often with an angle of women empowerment. Thus we talk more and more about exercise, as it has become the new cool; all it takes is to look at communities like Nike or Adidas, exercise is a new cult much like the cult of Apple. E: The same applies, there is a form of competition around “who will have the most advanced yoga outfit”, who will wear the nicest pair of sneakers jogging or to complete their Nike circuit. Who will look the most like Gigi Hadid leaving their spin class. And even the whole trend of sportswear/streetwear. I cannot easily relate as for me exercise is still something personal, but it has definitely become a real subject in fashion. We are quite free with our sexuality but less with regard to being proud of our bodies and to do so openly. It is rude to talk about ones body. I think Parisians pay special attention to their figure so have to exercise, but speak little about it, or do so mocking themselves as they cannot admit that a figure is something you have to work at: the famous fantasy of “the effortless French way”. E: I have no idea! But if I had to guess, I would say it is something linking both exercise and style. I find in a certain sense that the brand Vêtements incarnates this generation’s streetwear but fashion trend. I/O: Your favorite piece of sports clothing? E: The legging. I know it is a lame response but you need little to be happy! I/O: A suggestion for well-being or an indispensable product for exercising? E: I really enjoy the few minutes of relaxation/meditation, the breathing after yoga that allows your body the time to absorb the practice is so important. I saw a great change when I learned to breathe. It releases everything else. E: A great hair tie! I/O: Dressed in black from head to toe or you allow yourself color? E: Nope, all in black! I/O: Your rituals before and after exercise? E: Meditation, sometimes a scrub after yoga, ideally after a hammam, a lot of water. I also walk a lot it avoids doing an hour of intensive exercise and then nothing afterwards. 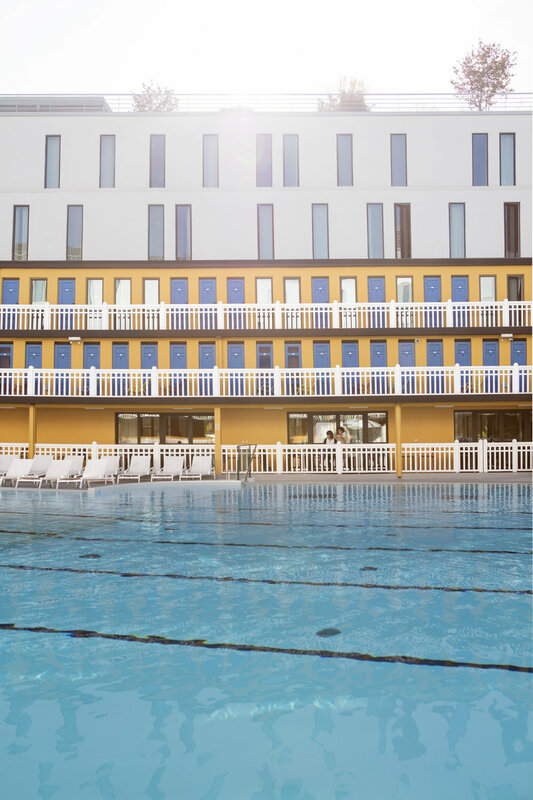 I/O: Is there a fitness or wellness destination on your travel list? E: I have been dreaming of doing a week of yoga in Hawaii, or maybe surfing? I recently tried surfing for the first time and I loved it. For me it is the ideal way of being far from everything. I am fixated on this destination it seems magical. I/O: Does music play a central roll in your choice of activity? E: Yes, very much so, but not during unless I am running. It can really influence my mindset when I am exercising, but overall I like being entirely present, without looking for distraction, which is what music can be at times. E: Yes I am very sensitive towards feminism to the new or older sense of the term. It is great that feminism is having another movement, and I find it more inclusive but the ideals of the first movement are also fundamental. I think in the way in which we refer to women in sports, that a woman can be strong, is something we do not repeat enough to younger girls, strength is something that can provoke fear in women, especially when confronted to men. I/O: Do you practice by yourself or in a group? I/O: Have you met friends while doing wellness activities? E: I talk with friends but not while I practice because I am rather solitary and I like to think of these moments as moments for myself. I/O: Do sports give you an impression of belonging to a community? E: Not really, because the notion of community scares me a little. Perhaps more as way to connect socially. Swimsuit: Erès. 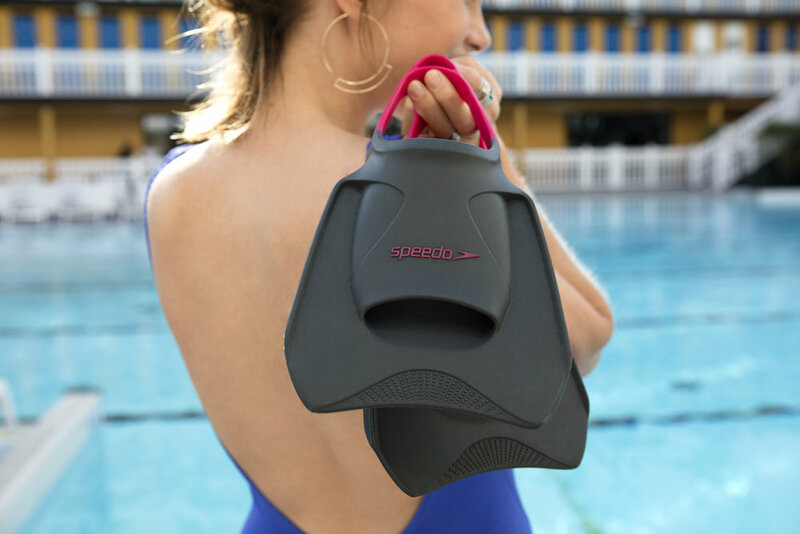 Swim Fins: Speedo. Flip Flops: Fila. 1 suggestion: Always think about the sensation AFTER the class not during. Think about the result not the process, this is motivating. 1 coach: I do not know anyone yet in Paris, but I can recommend Yoga Collective in Venice Beach, in LA (yes, okay it is very snobby to say so, but if you go their pricing is advantageous and I like their teaching style). 1 playlist: My playlist EVERYTHING is on Spotify. 1 application: I like Moves which is like a pedometer. It made me addicted to walking and I rediscovered Paris. 1 restaurant address: Miznon, for pita/ratatouille and a roasted sweet potato. My last meal on earth if I had one. Miznon, 22 rue des Ecouffes, 75004 Paris. 1 beverage: Water, it is still what’s the best! A chai latte with almond milk, to not die of boredom! 1 inspiration: Bjork. I love her sensibility and personal approach to expressing her creativity. She kept a form of naivety that renders her moving, but she is also one of the strongest women in the contemporary art scene and I love that she never excuses herself for being who she is. 1 person we should interview : Maria Galleriu (@MariaGalleriu), a wonderful friend who lives in LA, loves tarot and surfs after work, all of this while making fun of herself à la francaise. Thank you to the Molitor team.